BOCA RATON, FL (February 8, 2013) – The Allianz Championship and Boca Raton Regional Hospital (BRRH) announced that the Moabery Family Foundation (MFF) has set a new annual “champion’s challenge” for defending champions of the PGA Champions Tour’s first full-field tournament of the year. Announced at the Allianz Championships Pro-Am Draw Party filled with 400 PGA pros, sponsors, community and business leaders, and media this week, Allianz Championship Tournament Director Ryan Dillon reported that beginning with this year’s championship rounds, the MFF will launch its annual pledge to the nonprofit Boca Raton Champions Golf Charities based upon the performance of the defending champion Corey Pavin at The Old Course in Boca Raton. Funds raised by the annual MFF champion’s challenge are earmarked to benefit Boca Regional’s Toppel Family Place Neonatal Intensive Care Unit. According to MFF President Cathy Moabery, each year the MFF will donate $1,000 per birdie and $5,000 for each eagle scored by the defending champion, with a minimum gift of $10,000 per year if the golfer does not play well or withdraws for injury. In addition, if a defending champion does not play in a subsequent year, tournament management, Boca Raton Regional Hospital and the MFF will jointly choose the highest ranked player to represent the pledge. “I had the pleasure of playing with Corey Pavin at last year’s Pro-Am that benefited the hospital, and this year, he is playing on behalf of the hospital with a great new incentive,” noted Abdol Moabery, whose son, Chase, spent three weeks in BRRH’s Neonatal Intensive Care Unit after his wife Cathy gave birth. “Because Boca Raton Regional Hospital and its outstanding neonatal services are blessings to so many, Cathy and I are pleased to establish this annual championship fundraising challenge,” added Moabery, who serves as president and chief executive officer of GA Telesis. Toppel Family Place at Boca Raton Regional Hospital offers beautifully decorated labor and delivery suites with all the comforts of home, family-centered mother/baby nursing care, lactation services, a level II neonatal intensive care unit, board-certified neonatologists on-site 24/7, maternity nurses available 24 hours a day and support groups for mom, dad and the entire family. With equipment designed for infants and a hospital staff who has special training in newborn care, the BRRH NICU is an intensive care unit created for newborns that need specialized treatment. Babies who need to go to the unit are often admitted if they’re born prematurely, have difficulties during delivery or show signs of a problem such as infection, breathing difficulties or feeding problems in the first few days of life. For more tournament information, tickets, premium ticket packages, skybox and VIP seating, Grapes On The Green event tickets, call 561-241-GOLF (4653) or visit www.allianzchampionship.com. Follow us at Facebook.com/AllianzChampionship and on Twitter @AllianzChamp. The 2013 Allianz Championship, in its seventh consecutive year at The Old Couse at Broken Sound, will bring the legends of golf to Boca Raton from February 4thto 10th for the first full-field PGA Champions Tour event of the season. 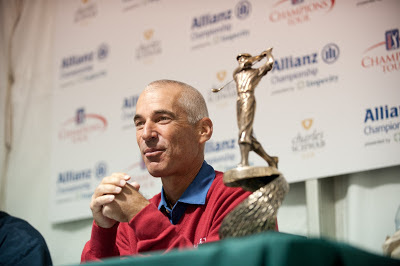 Its 2012 champion Corey Pavin is set to defend his title as challengers Tom Lehman (2011 champion; 2011 and 2012 Schwab Cup winner); Bernhard Langer (2010 champion), Mark Calcavecchia, Fred Couples, Fuzzy Zoeller, Tom Watson, Fred Funk and Champions Tour newcomers Vijay Singh and Colin Montgomerie vie for a $1.8 million purse with all three rounds televised live nationwide on The Golf Channel. The Boca Raton Champions Golf Charities (BRCGC) serves as the operational and financial oversight group for the event as well as for the distribution of all charitable funds, as all net tournament proceeds “chip-in” to benefit Boca Raton Regional Hospital. Managed by Pro Links Sports with title sponsor Allianz Life insurance Company, the annual tournament has attracted 31 of the top 34 professionals on the money list. For skybox tickets and other hospitality, call: 561-241-GOLF (4653) or visit www.allianzchampionship.com. Follow us at Facebook.com/AllianzChampionship and on Twitter @AllianzChamp. With equipment designed for infants and a hospital staff who has special training in newborn care, the NICU is an intensive care unit created for newborns that need specialized treatment. Toppel Family Place is a level II intensive care unit, which treats critically ill or premature babies. Babies who need to go to the unit are often admitted if they’re born prematurely, have difficulties during delivery or show signs of a problem such as infection, breathing difficulties or feeding problems in the first few days of life. We are family-centered NICU which means we encourage active participation by the parents and family in the care of your baby. We recognize that we provide care for a short time, but that you and your family will care for and nurture your baby for a lifetime. There is substantial research that demonstrates the importance of parental hands-on care and touch in supporting growth and development and decreasing the incidence of complications of prematurity. GA Telesis is the global leader in the commercial aerospace support industry. With sales, redistribution and component maintenance facilities throughout the United States, United Kingdom, Mexico, Middle East and Singapore, GA Telesis has the largest independent inventory of full traceable Boeing, Airbus, Douglas and Bombardier rotable components and is also the leading redistributor of engine components for the CFMI, GE, P&W and RR engines. Our component maintenance services cover over 25 ATA chapters spanning over 10,000 part numbers.